Borough Leads must exclude employees of Danone Limited, their immediate families or anyone else connected with this promotion. Borough Leads will automatically be eligible to enter this competition, and no confirmation of participation is needed from any Borough Lead. Save for the promotion of the Eat Like A Champ campaign, entry to this competition is without any obligation to prescribe, supply, administer, recommend, buy or sell any of the Promoter’s products or services. All Borough Leads are automatically entered in to this competition. The promotion starts at 9:00 AM GMT on Monday 21st November 2016 and closes at 23:59 PM on Thursday 15th December 2016 (the “Competition Period”). Borough Leads must promote the Eat Like A Champ campaign to schools within their respective London Boroughs and encourage Year 5 classes within those schools to sign up to Eat Like A Champ through the following website (www.eatlikeachamp.co.uk) during the Competition Period. There is no upper or lower limit on class size. One London Borough will win the competition. The London Borough which registers the most Year 5 classes to the Eat Like A Champ campaign during the Competition Period will win the competition. 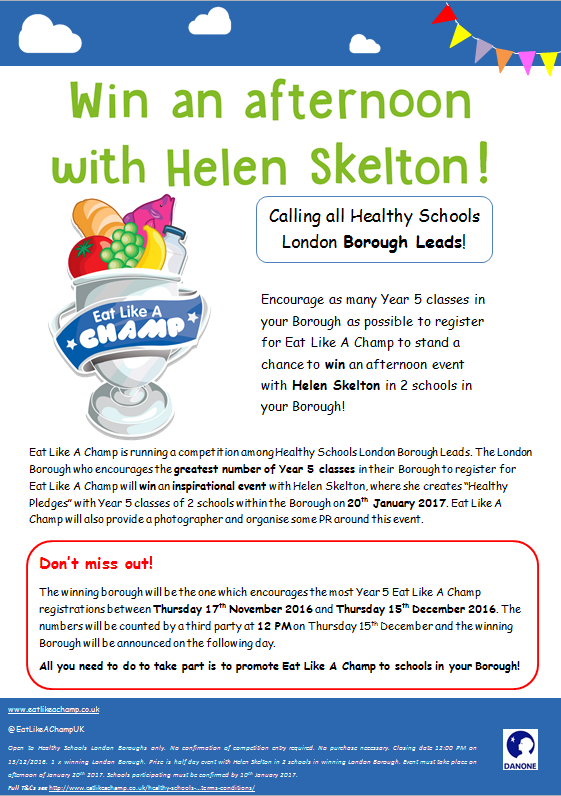 In the event of a tie (two or more London Boroughs have obtained the same number of Year 5 classes registered to the Eat Like A Champ campaign), the London Borough which has registered the largest number of schools within its respective London Borough to Eat Like A Champ during the Competition Period will be deemed the winner. If there is still a tie after these criteria are taken into account, the winner will be determined at the sole discretion of the Promoter. The Promoter’s agent who monitors registrations to the Eat Like A Champ campaign through the www.eatlikeachamp.co.uk website will notify the Promoter of the winner at the end of the Competition Period. The Promoter will make reasonable efforts to contact Healthy Schools London’s Healthy Schools Manager (Alison Stafford at the date of these terms and conditions) by email by 17:00 PM on Friday 16th December 2016. Alison Stafford shall then inform the Borough Lead(s) of the winning Borough to give full details about the prize. If the Borough Lead(s) of the winning Borough cannot be contacted or do not respond or is not in a position to accept the prize, the Promoter may at its absolute discretion withdraw that prize entitlement and to select an alternative winner. The alternative winner will be the London Borough with the next greatest number of Year 5 classes registered to the Eat Like A Champ campaign during the Competition Period. The winning London Borough agrees to participate in any publicity accompanying or resulting from the promotion. No additional compensation will be awarded for such promotional activity. The winning London Borough will win a half day event with Helen Skelton visiting two primary schools within their London Borough to inspire the children and create a ‘Healthy lifestyle pledge’ display for their school or classroom. This half day event will take place during the afternoon of Friday 20th January 2017. The Borough Leads for the winning London Borough are required to have confirmed two schools to take part in this event by no later than Tuesday 10th January 2017 by email to Alison Stafford (Healthy Schools London’s Healthy Schools Manager at the date of these terms and conditions). Healthy Schools London’s Healthy Schools Manager will in turn inform the Promoter of the two schools selected by the winning London Borough. The Promoter will then brief the two schools from the winning London Borough that will be participating in the half day event, including the exact timings for the half day event itself. This half day event will require no special preparation or resources from the schools involved other than access to basic school facilities, utilities (such as internet and electricity) and a blank display board. Helen Skelton will speak to children at the two schools about her experiences and tie in some of the key Eat Like A Champ messages. There will be a short Q&A with the children, as well as the opportunity for photographs and autographs. There will be an activity in which Helen and the class children create ‘Healthy Lifestyle pledges’ to decorate a display board. All resources for decorating the display board will be provided by the Promoter. Transport for Helen Skelton and the Borough Lead(s) between the schools will be provided by the Promoter. A photographer for the event will be provided by the Promoter and the Promoter will write a press release to be circulated to local and national news about the event. The name of the winning London Borough, along with the names of the Borough Lead(s) will be available on the www.eatlikeachamp.co.uk website within 3 months of the closing date. Incomplete, illegible, misdirected, late or bulk registrations to Eat Like A Champ through the website will not be accepted. The Promoter accepts no responsibility if entries are lost or not received or delayed, including delay due to technical error. The prize is as stated and there are no alternative prizes or a cash substitute. The prize is non-transferable. This promotion is not sponsored, endorsed or administered by, or associated with Twitter or any other social media platform on which it may appear. By participating in this promotion, all entrants release Twitter (or any other social medial platform on which it may appear) from any liability arising out of this promotion. Skelton Production Limited and the James Grant Group are not connected or otherwise associated with this promotion. PROMOTER: Danone Limited, 6th Floor Building 7, Chiswick Business Park, 566 Chiswick High Road, W4 5YG. Please do not send entries to this address.